Find your place in the stream. 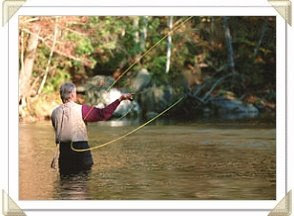 One of the great outdoor activities in Gatlinburg and the Great Smoky Mountains National Park is trout fishing. Whether you’re a pro or just got your first pole, the City of Gatlinburg has several streams that are easily accessible and sure to have that fish you’ll be talking about for years. Most days, you can fish inside the city limits or in the National Park. Purchase your license by stopping by our Gatlinburg Welcome Center, located on the right as you come into town on 441 South. The City of Gatlinburg has its own trout farm and stocks the streams on Thursdays, so there is no fishing inside the Gatlinburg city limits on Thursdays. There are some rules and regulations and different license requirements that we’ve listed below so you’ll know exactly what to expect in planning your fishing trip. students enrolled in a Tennessee college or university for at least six months. NOTE: Tennessee Residents with a Sportsman License (Type 40) or a Lifetime Sportsman License do not need any other license or permit. Military Personnel on leave carrying copy of leave orders. (A pass does not meet this requirement) – No license required. Age 13-15 years – Gatlinburg permit, One-day (type 99) or Three-Day (Type 96) PLUS Junior Hunt, Fish, and Trap License (Type 02). Age 16 to 64 years old – Gatlinburg Permit, One-day (Type 99) or Three-Day (Type 96) PLUS Annual Trout (Type 22) and ONE of the following: Annual Hunt and Fish Combination (Type 01), County of Residence (Type 20), and One-day Fishing (Type 21). NOTE: If born before March 1, 1926, no license or permit required. The Little Pigeon River at Herbert Holt Park is home to a unique and new feature: a handicap fishing pier. The concrete ramp winds from the parking area down along the river around several turns, meeting all wheelchair slope requirements, to a concrete pier built where once was a sandy beach in the bend of the river. The ramp allows wheelchair-bound people to get right down next to the river to fish, and is unique because it is among the first, if not the only fast-water handicap fishing pier in Tennessee. PERMIT: In addition to State Licensing requirements, a local permit is required for residents between 13 and 64 years of age, and for non-residents 13 years of age and above. Special exemptions may apply to all other age groups and those with disabilities. Check with local licensing agent for details. Permits are available at City Hall, Spur Welcome Center, and other outlets. Fishing is allowed during daylight hours only, which is defined as one half hour before sunrise to one-half hour after sunset. Fishing is permitted with one hand-held rod and a single hook only. All multiple hooks are prohibited. No one over 12 years old is allowed to fish in any Children’s Stream. Gatlinburg streams are closed to fishing on Thursdays due to stocking. Daily creel limit is five (5) trout for General Streams and two (2) trout for Children’s streams. Total creel limit is five (5) trout. While fishing or while afield, possession of more than the daily creel limit is prohibited, regardless of whether trout are fresh, stored in an ice chest, in a vehicle, or otherwise preserved. There is no size limit and any type of bait may be used. Only single-hook artificial lures are permitted. The use or possession of any bait is prohibited. Definition of bait: any living or dead organism, or prepared substance, designed to attract fish by taste or odor. Bait includes, but not limited to fish, fish eggs, crayfish, worms, grubs, crickets, corn, cheese, bread, pork rinds, putty or paste-type products, and flavors or scents applied to or impregnated into artificial lures. All trout must be immediately returned unharmed to the water. Possession of any trout is prohibited. West Prong Little Pigeon River from National Park Boundary downstream to Gnatty Branch, except those sections set aside as Children’s Streams. Dudley Creek from National Park Boundary downstream to West Prong Little Pigeon River, except those sections set aside as Children’s Streams. Roaring Fork from National Park Boundary downstream to West Prong Little Pigeon River. LeConte Creek from Painter’s Branch downstream to West Prong Little Pigeon River. West Prong Little Pigeon River from a point to 100 yards upstream of the Herbert Holt Park Entrance downstream to the Gatlinburg By-Pass Bridge. Dudley Creek from the Highway 441 Bridge downstream to the West Prong Little Pigeon River. LeConte Creek from Painters Branch upstream to National Park Boundary.